Our services will help you maintain your soft furnishings in top condition and you will use them longer. We offer highly effective and reliable sofa cleaning to the residents of London that will make your sofas and armchairs impeccable. All of our cleaning workers are qualified and have the necessary equipment to ensure professional and thorough sanitising of different types of upholstery. They will remove the spots, soiling and dirty patches from you soft furnishings and protect them from wear and tear. Before starting the cleaning process, our employees check the condition and type of fabric of the item that needs to be cleaned. They choose the most appropriate machines, detergents and equipment for sanitising. The next stage is hoovering the sofas and armchairs to remove as much dirt as possible. All stains and dirty patches will be pre-treated and removed using the proper solvents. After that, the sofas will be steam or dry cleaned. Our cleaners use the most advanced machines and non-toxic products for removing stains, odours and spots. If you want to have perfectly clean and looking great soft furnishings, use our excellent sofa cleaning services that we provide in London and in the surroundings. You can rely on our qualified staff to restore the nice appearance of your sofas and armchairs and the results will exceed your expectations. The upholstery cleaning which we provide will save your soft furnishings from fast aging and wearing out. 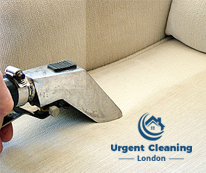 Use our professional sofa cleaning which is at your disposal in and near London every day in the week. You can contact our call centre to receive more information and schedule an appointment with our cleaners for a suitable date and time.